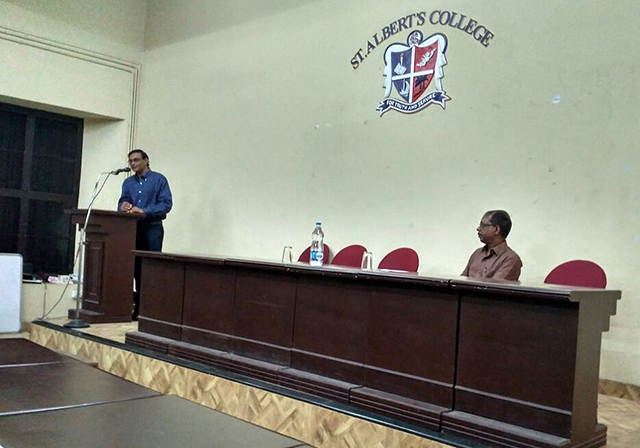 "Post-Conflict Reconciliation Action as a Social Worker"
Dr Ravindra Ranasinha, Drama-Therapist and Sociologist from Sri Lanka speaks at a function organised by Friends of Tibet in association with The English Association (TEA) of St Albert's College, Ernakulam on August 11, 2017. Friends of Tibet in association with The English Association (TEA) organised 'Post-Conflict Reconciliation Action as A Social Worker' talk by Dr Ravindra Ranasinha at the St Albert's College, Ernakulam, Kerala on August 11, 2017. Ernakulam, Kerala: Dr Ravindra Ranasinha, a renowned Sociologist from Sri Lanka, is acclaimed and respected for his psycho-therapeutic efforts to heal the war-torn people of Sri Lanka. He is recently in India to talk about his experiences in dealing with the ravages of war, for his India Lecture Tour organised by Friends of Tibet. The inaugural talk was held on August 6, 2017 in Coimbatore, Tamil Nadu and this was the second talk of the series. Dr Ranasinha began his talk by explaining the meaning and relevance of the phrase 'Post-Conflict Reconciliation Action'. He explained how the trauma of the quarter century long Civil War in Sri Lanka had left gaping wounds in the psyche of the affected Tamil population. While the physical wounds were attended to, the wounded minds of all these people were largely ignored. As a social worker, he was has dealt with victims of Post-Traumatic Stress, using several methods to help people cope with it and to reconcile with their situation. Dr Ranasinha said that in a Post-Conflict Trauma situation, the social activist has to often play the role of a healer. Explaining the diversity of Sri Lanka, he made the audience understand that Sri Lanka consists of nearly 30 communities, the Sinhala community being the majority. There are Sinhalese Hindus, Buddhists, Catholics, Sinhalese Moors, Indian Tamils, Indian Muslims, Burghers, Malays and many more sub-communities (the most recent addition being the Chinese community settling in Sri Lanka due to the economic and infrastructure cooperation between the two countries). Every community was affected by the war and currently coming to terms with a Post-War Sri Lanka. In the present Post War scenario, there is peace and the promise of development, but there is also a very difficult past which cannot be forgotten. A past that has inflicted many wounds that still remain unhealed. In particular, the loss of loved ones — perhaps the most difficult to reconcile with, loss of property — and the feeling of disenfranchisement that it brings about, loss of occupations and livelihood, loss of culture and identity — perhaps the most traumatic for a community. While the material losses like property and livelihood can be reimbursed and rectified, the psychological wounds left by loss of loved ones, loss of a culture and a way of life is irreparable. Sri Lanka currently finds itself in an unenviable position. A country that saw destruction for 30 odd years now needs to heal itself quickly and catch up with the rest of the world. A country that was destroyed with weapons and warfare now needs to apply a healing balm over itself and move on. Dr Ranasinha questioned the students of English if they were aware of the vast stores of literature on the losses of War. He made a reference to the famous British rock singer who sang sarcastically of war, Cat Stevens. He converted to Islam in 1977 and now calls himself Yussuf Islam. He sang a protest song about the US war with Iraq called Angel of War. Referring to the start of the war in 1983 as the 'Big Match' which ended only in 2009, leaving in its wake only destruction, Dr Ranasinha mentioned how people are still waiting for the loved ones to return. They do not know whether they are dead or just lost somewhere, perhaps injured and recuperating in some relief camp. There is a lack of closure as there few records of people who died. 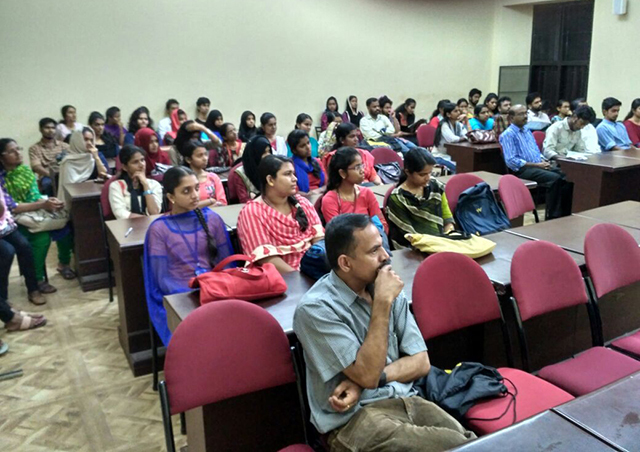 Dr Ravindra Ranasinha's talk was very interactive and he repeatedly posed questions to the audience. At one point he drew a historical parallel between the Battle of Kalinga to explain the effect of post-war trauma on people, as well as the perpetrators of war. Both sides get affected, nobody wins in a war. The Great War of Kalinga changed the history of India. Seeing the destruction and death, Emperor Asoka was distraught at his own victory. He embraced Buddhism and gave up violence. He was responsible for its spread outside India — in particular, Sri Lanka, where he sent his own son and daughter as special envoys many centuries ago. By drawing parallels between the situation in Sri Lanka and the current situation of Kashmiri people, he explained the effects of Post-war conflict in a manner that would be more relatable to a younger audience. A quick mention was made about the Swiss playwright, Friedrich Dürrenmatt who wrote the play 'Romulus The Great' in 1950. The play is set against the backdrop of the demise of the Roman Empire in the 5th century, taking place during the day of (and the day following) the Ides of March, 476. The ruin of the Empire is calmly expected by Emperor Romulus Augustus. Despite the attempts of his ministers and courtiers to force the emperor to take decisive steps against the Germanic invasion, Romulus prefers to stay at home breeding chickens and not taking any action in response to the threat. In the play (which is not based on hard historic facts — in fact, Dürrenmatt called it an 'unhistorical historical comedy') Romulus tells his people to destroy all their property and belongings in the face of approaching defeat and conquer by the Germanic army. So that nothing remains and nothing can be stolen. It is an ironic solution but telling of the lengths that mankind will go to, in order to retain their culture and identity. Destroy something in order to retain it. Dr Ranasinha felt the situation in Sri Lanka was a complex one that caused a whiplash in his mind. Like a functioning library that has several books, but there is no originality in the books. Losing one's culture and identity is akin to losing the very basis of our existence, our history. Dr Ranasinha mentioned the 8,000 plus war widows in Sri Lanka as an example of displacement and loss of identity. In the process of making a documentary feature, he met several war widows and was saddened by their plight. The many NGOs working for their emancipation have so far concentrated on material things — like giving them houses and a livelihood. But they are desperately in need of psychological assistance. They need to regain trust that was lost, they need to feel safe again, and they need closure. They need to share their stories, talk about their painful experiences in order to achieve catharsis. He uses several tools to help these people, and re telling of personal stories is one such tool. Mentioning the stories from Panchatantra as a shared heritage and therefore commonly understood, he talked about how the story format uses animals to simplify complex ideas and emotions. He uses this format to help the people regulate and manage their emotions. Post Conflict Trauma sufferers need to learn how to manage and regulate their emotions in order to lead a normal, functional life in society. Emotional regulation leads to behavioural regulation as everything in life is dependent on our thoughts. If we can control our thoughts, we can control our behaviour. A lack of this emotional regulation has led to severe problems for these affected people, ranging from depression, suicidal tendencies and violent behaviour. As a social worker one has to feel empathy for all people in order to help them, to understand where they are coming from and what is the reason for their behaviour. Dr Ranasinha feels that art, music, poetry, drama, films and stories can provide tools to help people. Explaining the importance of empathy for a social worker, he posed a question to the audience to test their understanding of the difference between sympathy and empathy; it was answered differently by different members. He then simplified the answer by saying that sympathy is emotional involvement in the problem — like crying along with somebody who has lost a parent. Whereas, empathy is deep understanding of the situation and offering concrete measures to alleviate it. Empathy requires one to take a step back and assess the situation so we can help. Empathy requires objectivity and that is what a social worker needs to practise daily. He talked about the importance of not imposing one's own ideas and beliefs on the affected people. A daunting task lies ahead when he returns to his work with the Sri Lankan communities; he will continue using the several tools at his disposal even though it is hard work. Dr Ranasinha also uses the method of Monologues to get people to narrate their stories. He asked how many from the audience told their own stories to a mirror. Explaining the significance of the auditory aspect in telling of a story, the importance of hearing one's own voice, he said the war widows had not heard other people's voices or even their own, for years. An experience still fresh in his mind took place just a few weeks ago in July. Dr Ranasinha met a widow who was very quiet. He found out that she had not spoken to anybody for fifteen years. She had been waiting for fifteen years for her husband to return. This was just one example of the extent of trauma people are suffering. Getting these people to express themselves was his challenge. Self expression is extremely important for humans. He asked if any members of the audience had a problem with self expression, and if so, what were the reasons for it — was it due to society or due to their own introversion. He talked about how society was not equipping people to express themselves. A majority of people when asked how they were would either reply that they were happy or they were sad. There are several other emotional states, but sadly we do not have the words or even the ability to recognise them. Our development as a human being starts when we learn to express different emotions and recognise them. The final target of a Social Worker is to ensure the social wellbeing of the people, and towards this outcome, Dr Ranasinha asked the audience to do a summation of what they had learnt regarding the tools available to them — which he mentioned in his talk. He was very happy with the audience involvement and response and hoped that they had learnt valuable things by attending the talk.